The Rosetta engineers have decided it is safe to lower the spacecraft’s orbit and bring it to within 13 miles of Comet 67P/C-G’s nucleus. They will spend a week at that altitude and then decide if it is safe to descend to only 6 miles. In releasing Wednesday’s image of Comet 67P/C-G, the Rosetta science team suggested that readers download it and play with the brightness and contrast settings to bring out some interesting details. [I]f you adjust the contrast of the image you will see that there is a lot of ‘noise’ in the background. Some of this is simply detector noise and cosmic rays, but there seem to be a few bright objects that may be dust/ice particles between Rosetta and the comet. The image on the left above is the image as released. The image on the right I have brightened considerably to bring out additional details. As they noted, you can see topographical details in the shadowed neck area. Also, the entire nucleus seems to be surrounded by faint dust streaming away in all directions. It is going to be a great deal of fun to watch this comet change over the next year as it makes its journey around the Sun. The Rosetta science team today released their first analysis of the chemical make-up of Comet 67P/C-G’s coma, finding that not surprisingly it is made up mostly of water, carbon monoxide, and carbon dioxide. However, ROSINA [the instrument on Rosetta for doing this analysis] has made the surprising observation that the ratio between these species varies quite significantly, depending on where in the coma Rosetta is. Sometimes carbon monoxide is almost as abundant as water; sometimes it’s only around 10%. In addition, ROSINA has not only detected these main species already, but many of the expected minor ones, such as ammonia, methane, and methanol. If all goes well with maneuvers today, Rosetta will creep inward to an orbit only 16 miles from Comet 67P/C-G.
From this position the probe will begin gathering a global map of the comet nucleus. Nor is this the closest they will get. Over the next month they will move in again and again in weekly increments. A new mosaic of four Rosetta navigation camera images shows a faint jet of material coming from the comet nucleus. The jet appears to come from the neck between the two lobes, but that is uncertain. The first results from Rosetta’s ultraviolet spectrograph find the surface of Comet 67P/C-G to be surprisingly lacking in exposed ice patches. The lack is unexpected, considering that this same instrument has also detected evidence of water in the comet’s coma. The Rosetta science team announced today that they will unveil the chosen landing site for their Philae lander on September 15. Comet 67P/C-G as seen on August 23, 2014 from 38 miles. 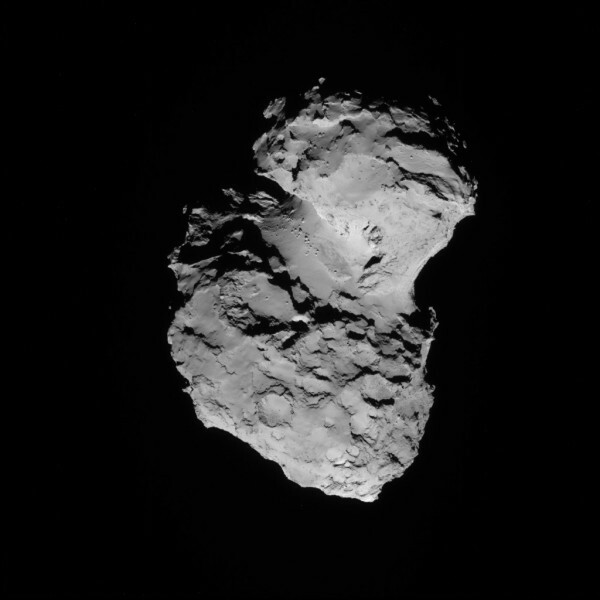 The Rosetta team has begun releasing more close-up images of Comet 67P/C-G taken by the spacecraft. The image to the right was taken by the navigation camera, but rather than capture the entire nucleus in a single image the camera is now zoomed in and taking a mosaic of four images. This picture is one quarter of that mosaic. Note the boulders and the sharp peaks in the image. 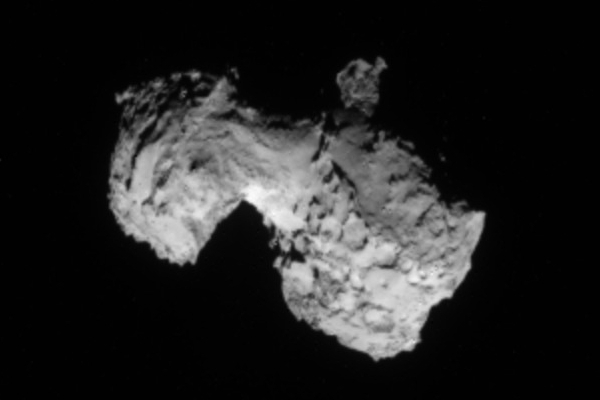 The boulders are important to map for planning Philae’s landing site. The sharp peaks suggest recent outgassing. The Rosetta science team has narrowed the choices for Philae landing sites on Comet 67P/C-G to five, three on the smaller lobe and two on the larger lobe. The smaller lobe sites, being on the outside surface of the lobe, don’t provide as good a view of the rest of the comet, while the larger lobe sites are on its inside surface, looking down at the neck and the smaller lobe. In addition, the terrain for the larger lobe sites looks to me more interesting. Being on the inside surface, however, the larger lobe sites are going to be more difficult to land on. from 40 miles. Click on image for full resolution. 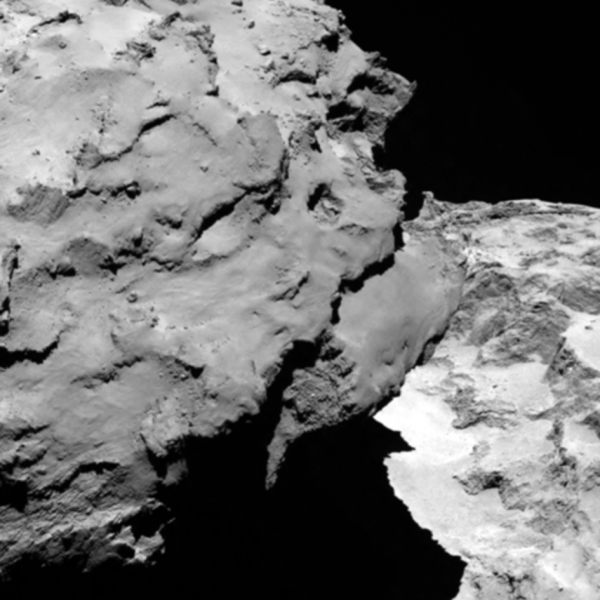 Engineers have begun the landing site selection for Rosetta’s Philae lander. This week, up to ten possible sites are being laid on the table for a first round of dedicated discussions and for the LCC and the SONC to carry out a technical analysis on each site, ready to be presented at the weekend meeting. Participants of the LSSG will then review the results from the technical analysis and discuss the scientific merits of the candidate sites. By the end of the weekend meeting, as many as five sites could be selected for further detailed investigation. They will announce the five finalist sites on Monday. Scientists, using radio and orbital data from Rosetta, have made their first estimate of the mass of Comet 67P/C-G. This is very much a preliminary number which will be refined significantly as the spacecraft continues its travels with the comet. More here. This mass, when considered in conjunction with the nucleus’s size, suggests a very low density. If you could find an ocean large enough it would float. The Rosetta science team has released a video and press release describing the upcoming maneuvers as it spirals into a close orbit of Comet 67P/C-G.
I’ve posted the video below the fold. If all goes well Rosetta will be circling the comet at a distance of about six miles come October 10. The Rosetta science team announced today that the spacecraft’s Grain Impact Analyser and Dust Accumulator (GIADA) has captured its first dust grains from Comet 67P/C-G. Earlier this month, GIADA detected the first four dust grains in its Impact Sensor. The first detection was made on 1 August, when Rosetta was 814 km from 67P/C-G, and about 543 million kilometres from the Sun. Further impacts from three more dust grains were detected on 2, 4, and 5 August, at distances of 603, 286, and 179 km from the comet, respectively. There is still too little data to come to any firm conclusions about the density and make-up of the coma, but this announcement confirms that the instrument is working as designed. When the comet zips past the Sun at its closest point on August 13, 2015, this instrument will then be able to give us a very good assessment of this particular comet’s behavior as it slowly evaporates. Meanwhile, the images keep coming. The picture at the top of the post was taken on August 12 from about 64 miles. 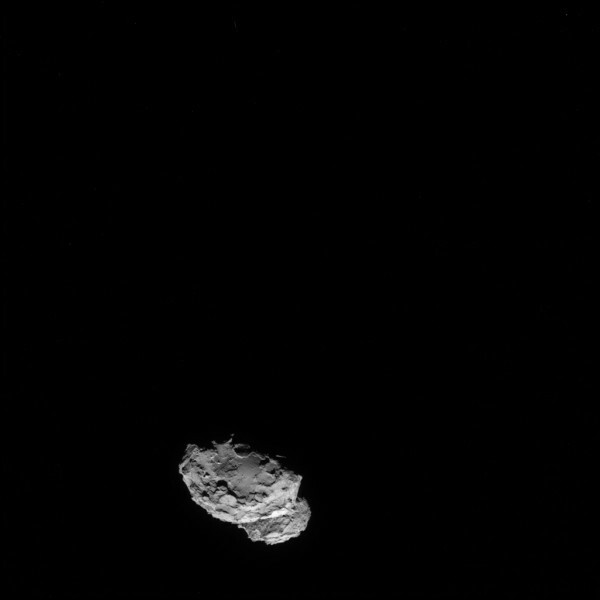 The above image is not the most recent daily image from Rosetta, but it is the most interesting of the last three. 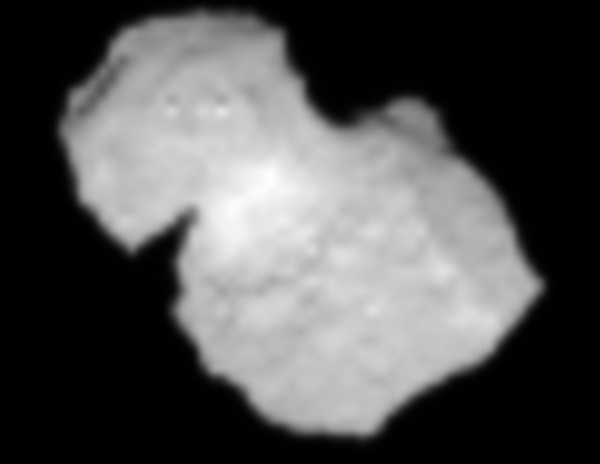 It shows the side of the comet nucleus that has not been featured in most images, as the topographical differences between its two sections is not as distinctly highlighted. What is highlighted is the neck that connects the two sections, lighter colored and thus likely made up of less dusty ice. Also of interest here is the circular features on the larger bottom section. These certainly resemble craters, and are likely remnants of early impacts that are now been corroded away as the nucleus’s ice particles evaporate off the surface. 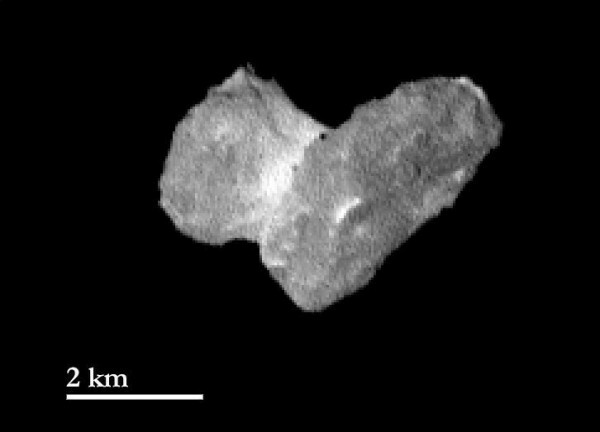 The scientific question here is this: Why are crater features more evident on this side and section of the comet nucleus than on other areas of its surface? The image above was taken on August 7 from only 52 miles. 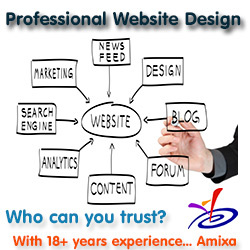 For the first time I had to scale it down slightly so that it would fit on the webpage. My impression with this image is that there actually might be hints of some very ancient craters at several of the vaguely circular pitted features. For example, look at the large feature on the end of the nucleus’s smaller component on the right. This might be a crater that now is significantly eroded as the comet’s surface evaporated away each time it approached the Sun every 6.5 years. The image above was taken at a distance of 60 miles by Rosetta’s navigation camera on August 6, the day the spacecraft rendezvoused and began flying in tandem with it. 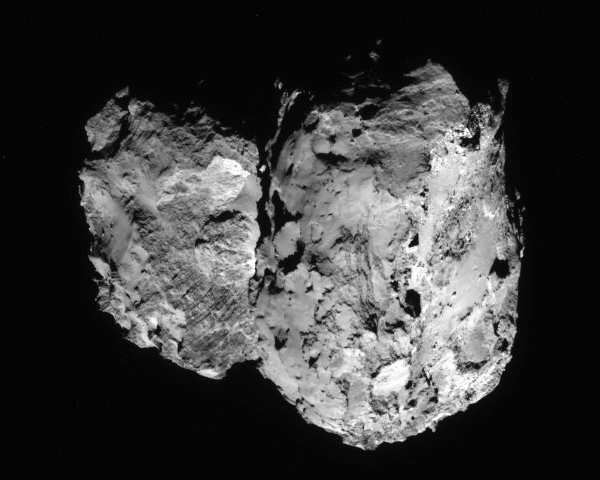 It looks at the “backside” of the comet, the side where the distinction between its two components is less pronounced. Once again, no obvious craters, and the surface is pockmarked and corroded. Rosetta has successfully achieved orbit around Comet 67P/C-G and has transmitted its first close up images. More information here and here about the rendezvous and what science the mission scientists plan to do as they orbit the comet. The image below is looking down and past the comet’s smaller component as it casts a shadow on the neck and the larger component beyond. As with the earlier images, the comet’s pitted and corroded surface, lacking any obvious craters, is reminiscent to me of a pile of dirty snow that has been dissolving away. In fact, when I lived in New York I would see this kind of look every winter. When the city would get a big snowfall snowplows would push it into large mounds on the side of the road. As time passed these piles would get dirty from the city’s soot and grime, and also slowly melt away. After several weeks it would look almost exactly like the surface of Comet 67P/C-G. The images and data that will come down from Rosetta over the next year and half as it orbits the comet in its journey around the Sun will be most fascinating. Stay tuned! How does Comet 67P compare with other comets? A quick preliminary comparison of the surface features of Comet 67P/C-G, compared to other comets that spacecraft have visited. As you can see, the comet is not centred in the full-frame image. This is a result of the rendezvous burn conducted the previous day, which adjusted Rosetta’s trajectory towards the comet. This effect is corrected for in the commands sent to the spacecraft after the new orbit has been determined. The science team also notes that beginning tomorrow, the comet will be close enough that they will no longer have to provide a cropped close-up using the navigation camera and that this uncropped raw version will be sufficient. Rendezvous and orbital insertion on Wednesday! Today’s Rosetta image of Comet 67P, shown above, gives us a different angle of the comet. 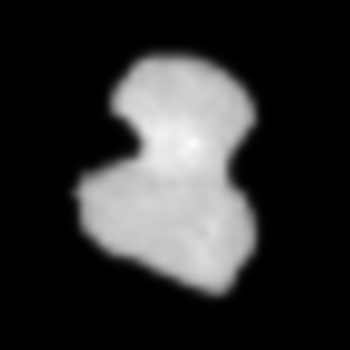 The spacecraft was only 186 miles (300 kilometers) away when it snapped the picture, and this side view emphasizes the nucleus’s jagged shape. I am reminded of what happens to a block of ice when you spray warm water on it. It begins to melt away, but very randomly and unevenly, producing very weird shapes and the surface evaporates off. In the case of Comet 67P, the nucleus is a dirty ball of ice, and the Sun’s rays have been causing its surface to evaporate off every time it approaches the Sun. Thus, we get a very weird shape. 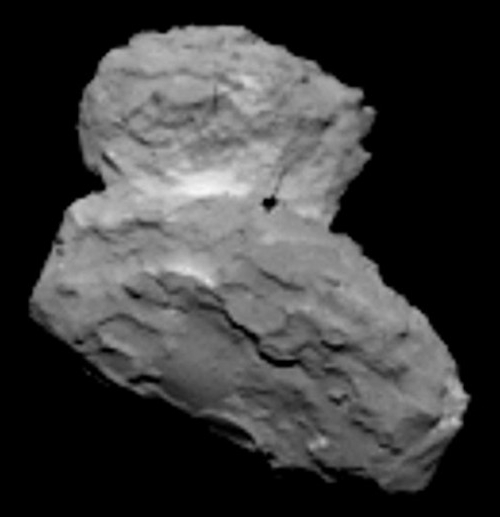 The image above was taken on August 2 using Rosetta’s navigation camera. It has been processed by the science team to bring out the details. 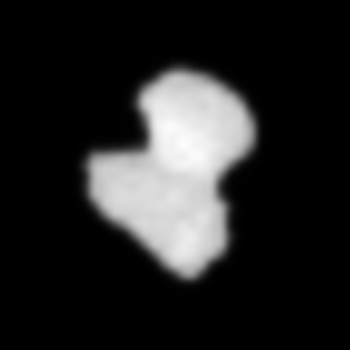 I have also rotated it to match the August 1 image taken at a distance of 620 miles that was taken by Rosetta’s OSIRIS narrow angle camera, designed to do the actual science. 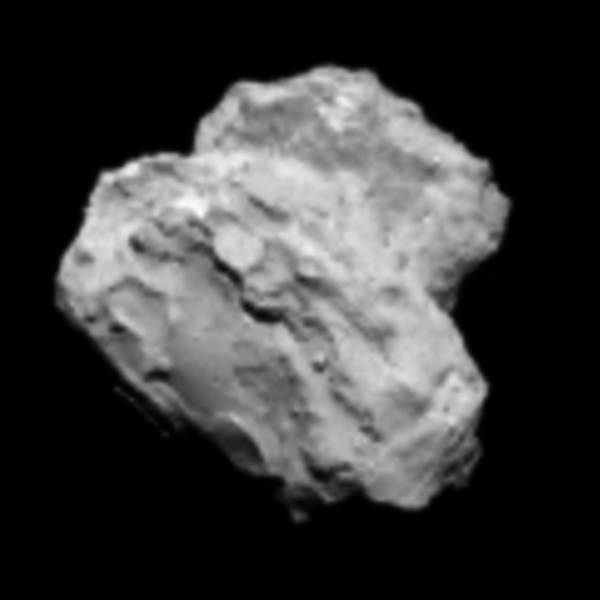 You can see that the navigation camera does a pretty good job on its own of capturing the comet’s nucleus. Both images show that the instruments are working perfectly, and thus tell us that the next few months will be quite spectacular after Rosetta goes into orbit in three days, followed in November by the landing of Philae somewhere on the comet’s surface. If you download both images and then switch back and forth between them you can get a better feel for the geometry of the surface features. Above is a new image of Comet 67P as seen from about 1000 kilometers, or about 620 miles, released by the Rosetta science team today. The image was taken on August 1 and has been processed somewhat to bring out the details. The black spot near the junction between the nucleus’s two sections is not real but an artifact of the camera’s CCD. This image is the first real clear and sharp look at the nucleus, and what it shows us is a surface quite different from the many other asteroids that science probes have imaged close-up in the past. From this angle there are far few craters visible then is normally seen on asteroids, and the surface has complex roughness and pitted look that I suspect the planetary geologists are right now scratching their heads about and waving their arms trying to explain. My first guess, which no one should take too seriously, is that as material vents off the comet when it gets close to the Sun it leaves behind these scars. One more thing: If you go here you can see a number of additional image releases in the last 24 hours, all fascinating. This link explains that the features that looked like craters in earlier images were actually artifacts from the camera’s CCD. 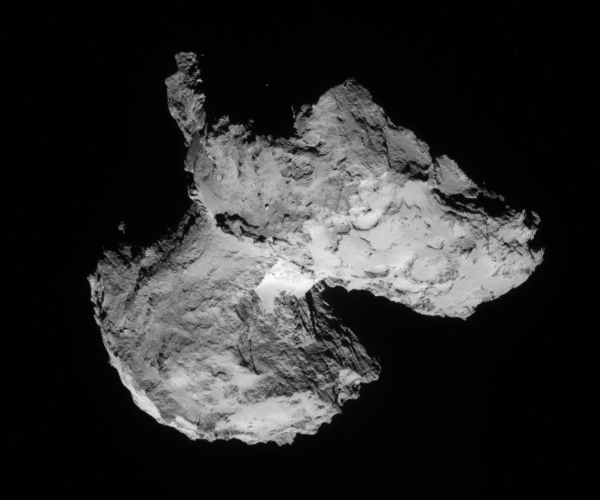 This image of Comet 67P from Rosetta was taken yesterday. Though it has not been processed like the image I posted yesterday, more details continue to come out as the spacecraft each day gets closer to the comet. 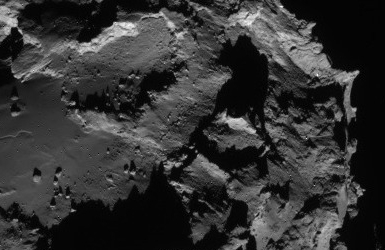 This image was taken from a distance of 825 miles, 375 miles closer than the previous day. Very soon these close-up images will become too large to show the entire nucleus in one image. 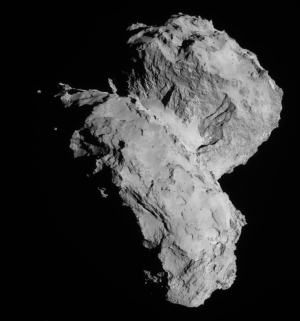 Rosetta will instead begin to snap images of specific features. Meanwhile, the Rosetta science team released its first temperature readings of the comet. 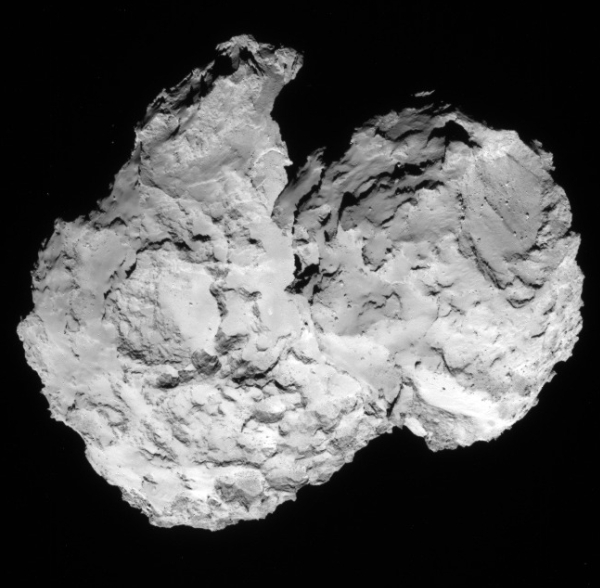 On the left is today’s Rosetta image of Comet 67P. If you compare it with yesterday’s image, it is larger, as the spacecraft has now edged closer, only 1,390 miles away. ESA has released today’s image of Comet 67P/Churyumov-Gerasimenko (which hereafter I am going to refer to as Comet 67P because that is easier to pronounce and remember) from a distance of about 1578 miles. They plan to release new images every day this week. I plan to post those images here as well. New images from Rosetta have a resolution of 100 meters per pixel and are finding that the neck connecting the comet’s two sections is apparently much brighter than the rest of the nucleus. 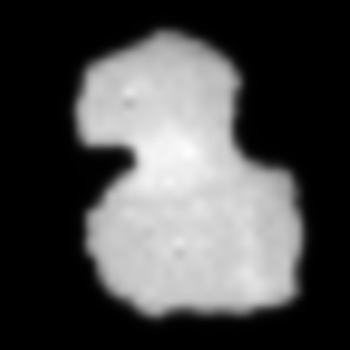 As earlier images had already shown, 67P may consist of two parts: a smaller head connected to a larger body. The connecting region, the neck, is proving to be especially intriguing. “The only thing we know for sure at this point is that this neck region appears brighter compared to the head and body of the nucleus”, says OSIRIS Principal Investigator Holger Sierks from the Max-Planck-Institute for Solar System Research (MPS) in Germany. This collar-like appearance could be caused by differences in material or grain size or could be a topographical effect. It looks like this comet is going to turn out to be one of the most fascinating objects any space probe has visited in a long time.